After my fuel stop in Espinilla I carry on south to Aguillar de Campoo, which is as far South as I’ll be going today. The roads here are open, and for the first time I enjoy 3 figure speeds on a completely straight stretch about 3 km long. 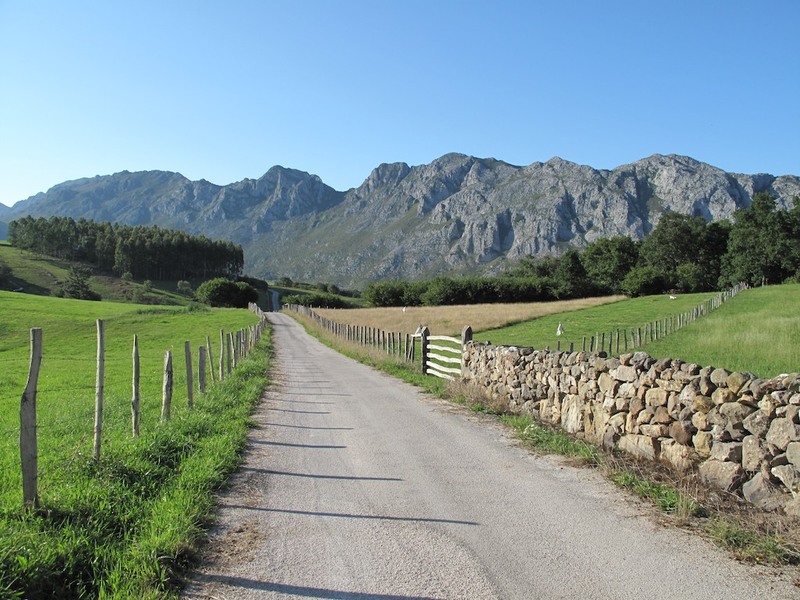 This is what I imagine central Spain to be like, dusty and hot, with the vanishing point of the road as vague as the horizon in a shimmer of heat. 37 degrees, got to keep moving. The cuffs of the jacket undone, I fill up like the Michelin Man but it still feels like 37 degrees. On a whim I try to get a closer photo of the castle in Aguillar, today’s cobalt sky and little fluffy clouds would make an ideal backdrop, but I don’t feel like walking up the hill on the edge of town and both attempts to ride closer to the magnificent ruin end first in a pine forest and then in a dead end by a newly built church. You have to hand it to the Spanish, they’re very good at building new things that are in keeping with traditional styles and their surroundings. I’ve seen many bridges, churches, and even farm houses with barns that have been constructed so that in a few years they’ll look as though they’ve always been there, at obvious expense. On leaving Aguillar I see a monastery on the left side of the road, but I’ve been dawdling around in town too long and want to get going again so I don’t stop. The Embalse de Aguillar de Campoo is yet another huge damn on the outskirts of town. This one has a sandy beach all around and is obviously popular with locals, who park their cars under any available shade before going off for a swim and a spot of sunbathing. 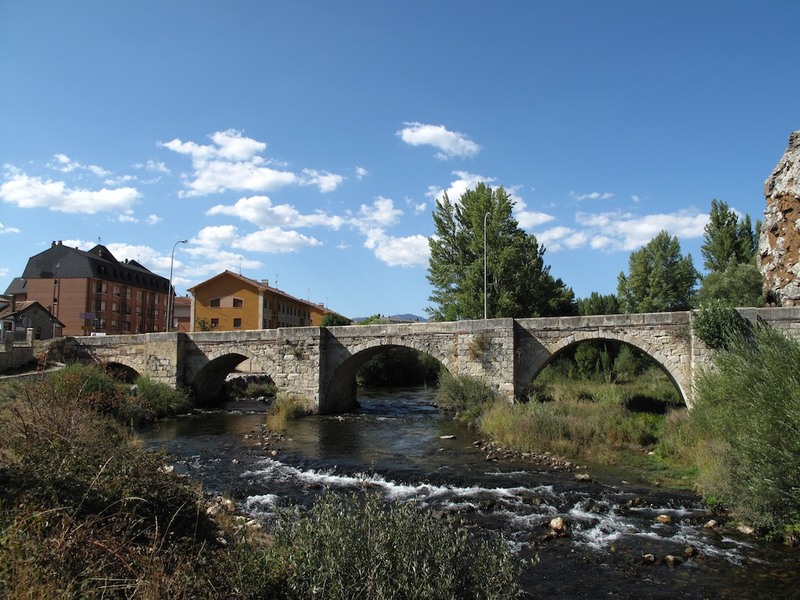 Having respected the Normas I head north out of Castilla y Leon on the CL627, passing through Cervara, and take a photo of one of the town’s two bridges. Nobody is around and the place appears deserted, must still be siesta time. I pull right onto the CA281 just north of Puerto de Piedrasluengas, intending to get a good photo of a section of road I’ve dubbed Ebbo’s Curve after the man who first posted a picture with definitive GPS coordinates. 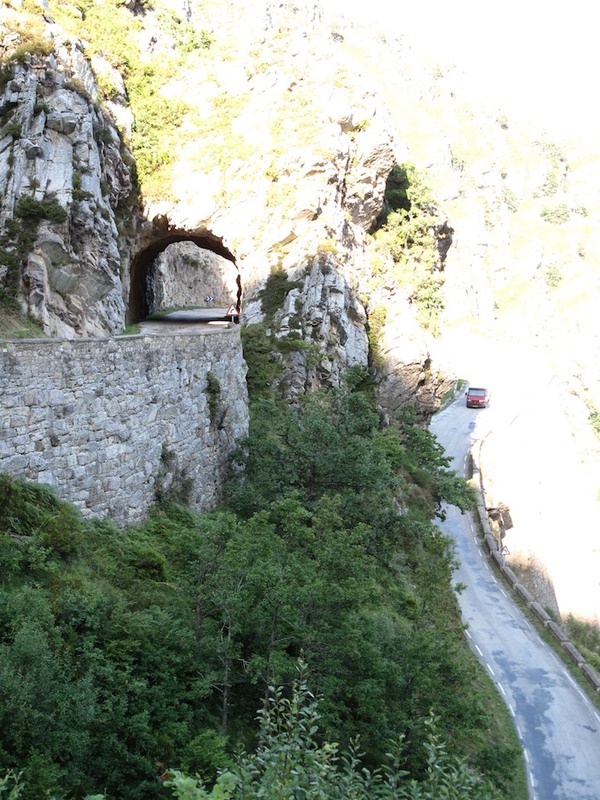 The picture shows a mountainous section of road which passes through a rock arc before turning sharply right and doubling back on itself as it drops steeply into the gorge below. It’s a bikers dream and was first posted by a guy called Alex back in the murky mists of time. The image was published in a magazine and, to cut a long story short, its location has been sought by many riders ever since. 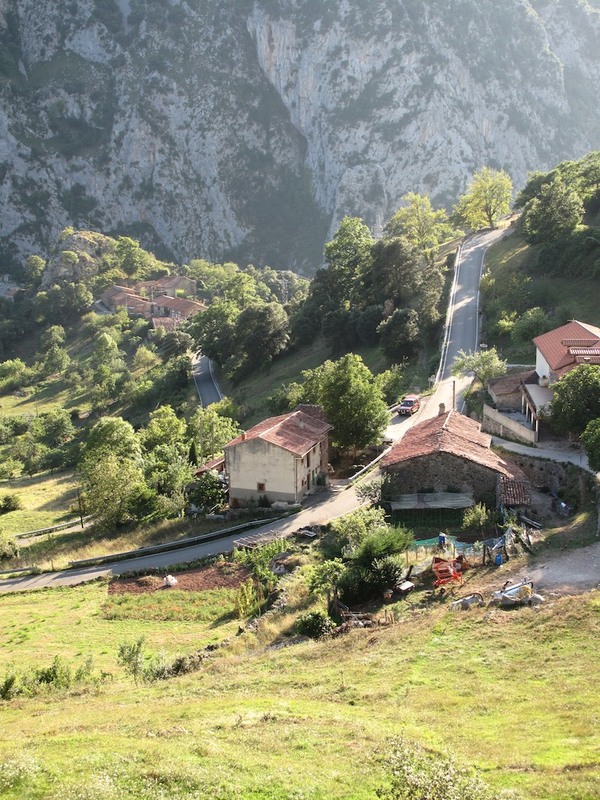 Great as it would have been to be the first person to publish a set of GPS coordinates for these magical bends, Ebbo has beaten me to it in his excellent blog. His (and edipalazzo’s photo on Panoramio) are way better than mine, but I’m going to blame my late arrival today and the consequent low angle of the sun. Will try to get back here tomorrow as close to noon as I can in order to make the most of the light and get a decent photo of my own. On the way back from Ebbo’s Curve my Garmin decides to direct me over an unpaved road in order to save a couple of yards over the tarmac alternative. Back in the UK I leave the ‘avoid unpaved roads’ feature disabled because there are precious few green lanes left to ride on, so when you do find one that you weren’t expecting it’s often a breath of fresh air rather than cause for re-planning, but out here the scope for literally getting lost in the woods is much larger, as I discovered when directed down a donkey path that ran out of the elbow of one particularly steep and angular bend. Another time, but not with road tyres and luggage. Riding back south to Potes, I take the same gorge road which gave me a misty exit two days ago, only this time the surface is dry, I’ve an excellent week behind me, and (I swear t’is so your honor) the bike just wanted to go! One overtake after another, the kind that are only possible when you’ve got more acceleration than everybody else and the ability to see past the vehicle in front. I pass 8 French (dress the same, look the same) Harley riders, 6 cars, 2 camper vans and a coach in about 4 km of very tight, twisty road, ending in a visor-shattering ‘whoo-hoo’ whilst standing on the pegs and punching the air. I decide to have another look at Potes on the way to Aniezo because my last impression was formed quickly and without really giving the place a chance. Parking the bike in front of a bank, I leave jacket and gloves padlocked to all my other gear and take a stroll around for half an hour with just my camera. All I can say is that sometimes first impressions are right – I won’t be coming back here. 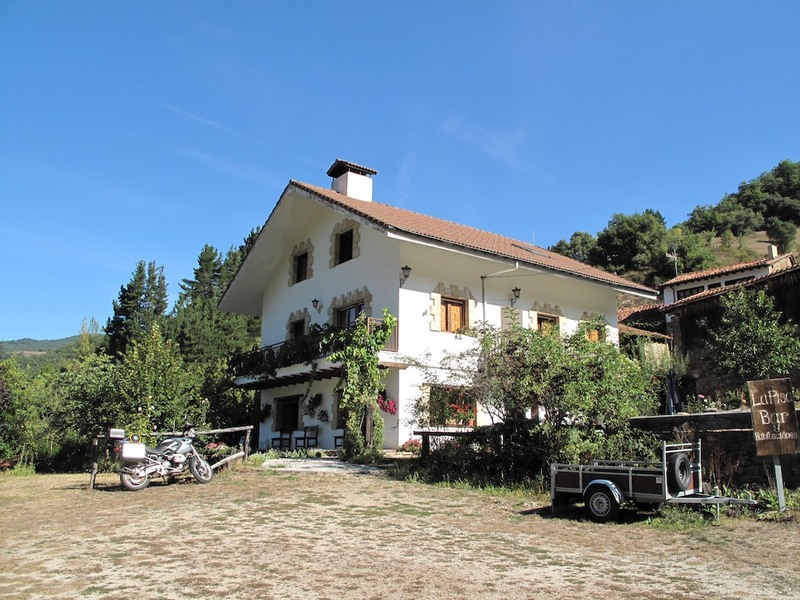 I arrive in Aniezo and 19:45 and check in with John and Gwen at La Pisa. A large beer is served and dinner ordered, and once I’m over the shock of a shower that I don’t have to share and an actual bed (with blankets and everything!) I head back down to the bar to talk to Gwen while John’s busy in the kitchen. The starter arrives; chorizo on a bed of fresh tomato, and I know it’s fresh because John went to pick it from the garden as soon as I’d ordered. The chorizo was already to hand, and is followed by fish on sautéed potatoes with crushed minted peas. Everything is cooked to perfection and for once I don’t mind eating a little earlier than I’d grown accustomed to over the past week. Plans for a little post-dinner blogging dissolve in the bottle of local vino tinto, and it’s when I try to send a text message back home that I suddenly realise that there’s no reception at all. Gwen tells me that it’s sometimes possible to pick up a signal if you go to the wooden bench behind the cider house, advice that leads me on a dark, drunken escapade during which I find a hedgehog the hard way (I’m wearing flip-flops), walk into a fence, and nearly fall off said bench onto somebody’s dog kennel because I get cramp in my arm from holding the phone aloft like some kind of offering. Wine aside, I’m much happier to be at La Pisa than I was when I booked my room two days ago. 48 hours ago I was still revelling in the adventure of everything; ordering food was largely down to luck and each night’s accommodation decided on a whim and the mood of the GPS. The outcome of my encounters with various people depended on their willingness to help – my effort at communication often played no part. Being at La Pisa seemed to cut short that adventure. I could have everything I desired, things were predictable again and conversation was easy. Two days ago that effortlessness seemed an intrusion to my adventure, but today it’s been an ideal way to end a perfect week. 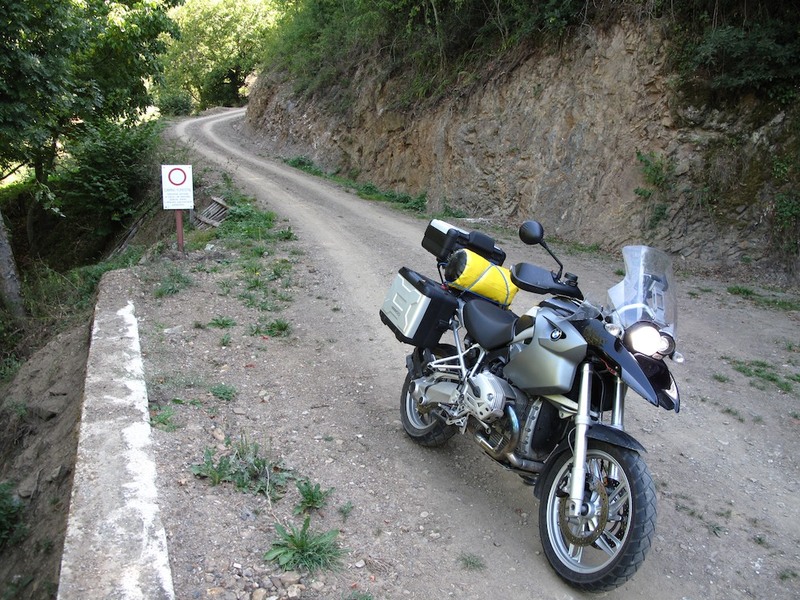 Tomorrow I will let somebody else make tea before riding back to Ebbo’s Curve and on to Santander.